You will be in awe of The Ledges golf course, designed by Matt Dye of the world-renown Jack Nicklaus Academy of Golf. 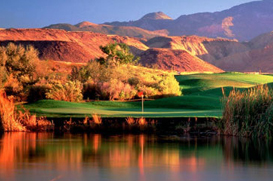 The 7,200-yard course has made headlines partly because of its unmatched setting in the rugged landscape of Southern Utah, but mostly due to its high-quality course. Capturing the heritage of the surrounding scenery, the course has enthralled golf pros around the country for years. You will never be short of the highest amenities during your golf experience at The Ledges. You can enjoy GPS-equipped golf carts, high-tech teaching facilities, beautiful driving range, and many other services designed to make your experience one of a kind. Aside from golfing, the community also offers a comfortable clubhouse to meet with your neighbors as you relax in engaging conversation or as you sit down and dine at The Fish Rock Grille located within the heart of the clubhouse. You and your family can get out and enjoy time at the community center fully equipped with swimming and play areas, a fitness center, and gathering nooks. Finally take some time, unwind, and relax as you take advantage of Valderra Resort & Spa with hot tubs, steam baths, and invigorating massages. The Ledges’ vision for their community boasts of providing a “vibrant future for the entire family.” Take a moment and use our free search to look through homes available in The Ledges of St. George. Our team is anxious to tell you more and help you find the right home for your situation. Call us today!